Not happy with the Optima batteries? Here is the competition! Designed to be a direct drop-in replacement for most new vehicle batteries, this Odyssey® battery comes in five terminal configurations. Top post only (lefthand positive), top and side terminals, top post and threaded studs, top post (righthand positive), and side terminal only, see pictures below. 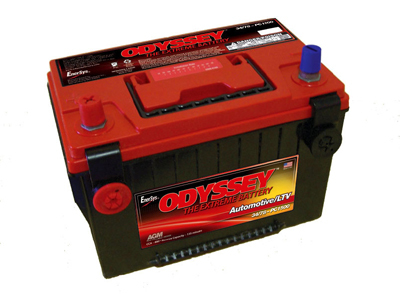 The PC1500 will provide more cranking amperage and reserve capacity, the advantage of not losing its charge over long periods of time, and this Odyssey® PC1500 battery has a 4 year full replacement warranty.